NE DOES NOT expect to hear great speeches at graduations, particularly from celebrities or from student speakers. More often than not, such works of oratory are more to be endured than enjoyed. It is a safe bet that most people have little recollection of what was said in the speeches at their own high school or college graduations. This year’s graduation season was marked with at least two exceptions to the norm. 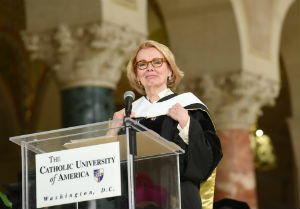 First, as a graduate student at The Catholic University of America, I was interested to learn that Peggy Noonan would be this year’s commencement speaker. Punctuated with moments of good humor, her mid-May speech clocks in just under 25 minutes, and it is deeply insightful about contemporary America. The general theme is that reading books is necessary in order to be an educated person. The corollary, of course, is that those who do not read books are (and appear) uneducated. You can read or watch her address here. Secondly, a truly magnificent speech was given in early June by a young man named David Hahn, the valedictorian of the Gregory the Great Academy Class of 2017. Gregory the Great Academy is a liberal arts boarding school for boys (grades 9-12) located near Scranton, PA.
Like Noonan’s address, Hahn’s speech is flavored with bits of comedy, and it is rife with insights that belie his youth. It is masterful in the way it appeals both to his classmates and to the parents, family, and faculty who were gathered for the occasion. When I came to St. Gregory’s my Sophomore year, I was not familiar with the ancient forms of the Mass. The traditions of the Catholic Church were as familiar to me as they are for any boy, I suppose. And so, when I arrived, I really didn’t know what I was getting myself into. As it turns out, my experience of the liturgy here at the Academy has been central to my time here, and it is the one experience that reflects my entire education. I was raised attending our local parish in a family with a Presbyterian background. What I found at St. Gregory’s was not the liturgy or the praise-and-worship that I was used to. I was exposed here to a liturgical diversity, especially in the Byzantine rite. Though it was strange at first, I quickly came to fall in love with the structure and the poetry of the Mass, and most of all, by the musical traditions that bind East and West into a chorus of divine praise. I came to know anew what I had always known, but never understood: the tradition of my Faith. Much in the same way as I was converted to appreciate the many beauties of the Divine Liturgy, I was drawn into a new understanding of the Roman rite, seeing in its structure a common purpose which is the purpose of salvation and the depth of the sacred traditions. Through these traditions and the experience of the liturgy, I was brought into a new experience of my place in the divine family and my spiritual heritage. I never knew how hesitant I was to encounter real experiences until I came to Gregory the Great, and I was thrown headlong into a new world of tremendous meaning and mystery. 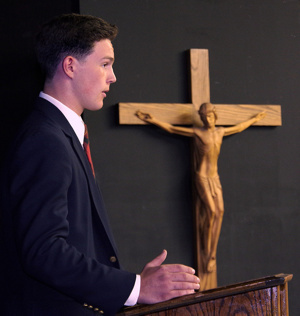 How many high school seniors do you know who could offer that reflection on the liturgy and its effect upon them? Taking the time to read Hahn’s full remarks will be worth your while. Readers may recall that I once featured Gregory the Great Academy on these pages, about three years ago. Click here to revisit my interview with Matthew Williams, the school’s music director. This interview offers a glimpse of what extraordinary things are possible when a school proposes to introduce its students to truth, goodness, and beauty in all their varied forms.